What do Alzheimer’s and Bacterial Biofilms have in common? New research is taking advances in the Alzheimer’s field and applying them to the field of infection biology to help combat antibiotic resistance. Bacteria don't do much on their own. A single bacterium is a pretty weak thing. It is vulnerable to attack from the immune system, if there are competing bacteria around it is likely to starve to death and if there are predators then it will be quickly gobbled up. It's not surprising then, that evolution provided a path for bacteria to form strong communities where they are much less exposed to harm from their surroundings. One type of bacterial community is the biofilm where bacteria cluster together in large groups and produce a sticky, protective slime to coat them and help them stay together and to attach to surfaces. When living in these communities, bacteria alter their behaviour. Many of the cells in a biofilm stop dividing or divide very slowly. This becomes a huge problem when trying to treat biofilms with antibiotics that tend to target actively growing cells. After a course of antibiotics, many bacteria from a biofilm will survive and begin to grow again leading to serious and recurrent infections. Biofilms are therefore a huge problem in hospitals. For one, they are very sticky so when they form, they are difficult to remove. Then they cause members of the community to become resistant and restrict treatment options to toxic or last-resort antibiotics. Many recent studies have also shown that biofilms harbor several different species of bacteria. It’s like one species makes a defense against antibiotics and the immune system then other bacteria come in to take shelter. This can lead to some dangerous alliances between pathogenic bacteria which help each other to survive and wreak havoc in unsuspecting patients. A big challenge in both hospitals and in the research lab is that we don’t know when a biofilm has formed. We can measure if bacteria are there but we don’t know if they have embedded themselves in the protective slime. This has implications for treatment and development of new therapies because medical professionals cannot be sure when to treat with normal antibiotics or if another approach is needed. Unfortunately, many of the methods and dyes we use for looking at biofilms today are very toxic to both humans and bacteria, meaning we cannot use them to treat patients or study the living biofilm. A recent study from npj Biofilms and Microbiomes describes a new way of detecting biofilm. A team led by Professor Agneta Richter-Dahlfors from Karolinska Institutet in Stockholm produced a new class of fluorescent “smart” molecule that binds specifically to the Salmonella biofilm. The work came from a collaboration with organic chemists in Linköping, headed by Professor Peter Nilsson. Agneta tells us how the collaboration was born. From Alzheimer’s Disease to bacterial biofilm! It seems farfetched but when you look at the structures of the amyloid plaques found in Alzheimer’s patients and the amyloid fibers formed in Salmonella biofilm, there is a lot of similarity. The research team quickly found that they could detect Salmonella, hypothesizing that the probe was binding to curli in the biofilm. However, one of the biggest surprises of the work came when testing this hypothesis, the team did find that the probe bound to curli, but they also found something else. 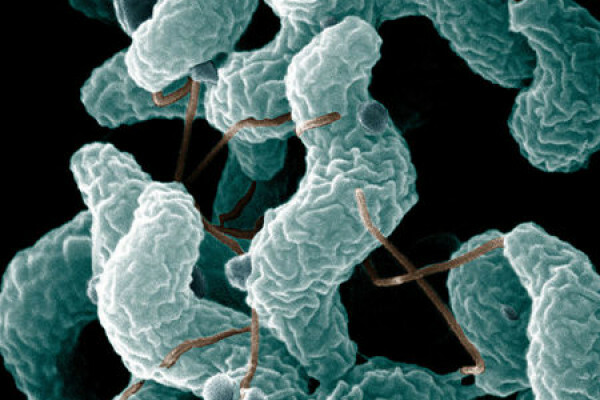 “We realized that the probe also bound to the carbohydrate cellulose, another major component in the Salmonella biofilm, in a way that is totally different from curli. My PhD student Ferdinand Choong became very excited when he saw this result, which meant that we could use one nanoprobe to optically detect two different components of the Salmonella biofilm simultaneously,” said Agneta Richter-Dahlfors. So the probe can bind to cellulose and curli, that means it’s non-specific, right? Well, not exactly, and that is why they have been termed “smart molecules”. To explain this, we need to go into the chemistry. The probes are short, well defined fluorescent polymers that emit light based on the conformation of the polymer backbone. If the backbone bends slightly, the spectrum of emitted light changes, so that the same molecule appears totally different. The research team quickly realized that when the probe bound to curli, it had one conformation and when it bound to cellulose it had another. These different conformations were visible in the light spectra emitted from the probe. So while the “smart molecule” does bind to both cellulose and curli the signal from each is different and it is possible to tell them apart. The team are now working on making new “smart molecules” to detect different compounds that are produced by bacteria during infection. They are also working on incorporating these probes into early detection systems that can be used both in hospitals and food safety. An exciting property of the probes is that they can also conduct electricity. This means that in the future, researchers can use the specificity of the optical probes to give an electronic readout of biofilm composition and incorporate them into devices already found in the hospitals. Real-time optotracing of curli and cellulose in live Salmonella biofilms using luminescent oligothiophenes. Next The obesity pandemic - an epigenetic time bomb?